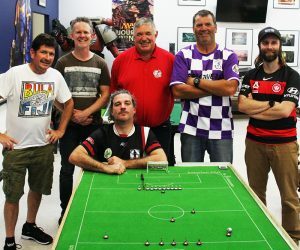 After a holiday hiatus, Subbuteo Parramatta got back into the swing of things with a New Year’s WASPA Tournament on the evening of Monday, January 9, at the Subbuteo Parramatta clubhouse. 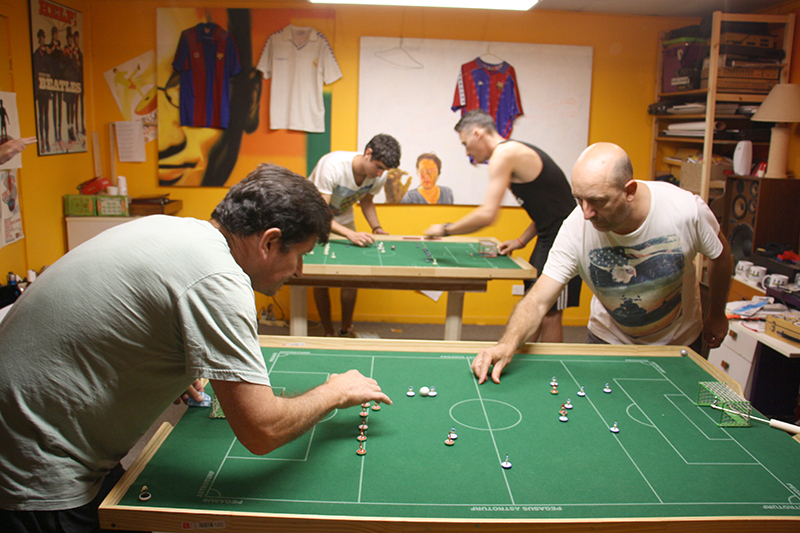 With newly placed air-conditioning, the normally sweltering in summer clubhouse was cooled to just ‘warm’ and, from all reports, no perspiration was dropped onto any of the pitches. A field of 7 players, representing 4 of Sydney’s clubs, came together to battle it out. 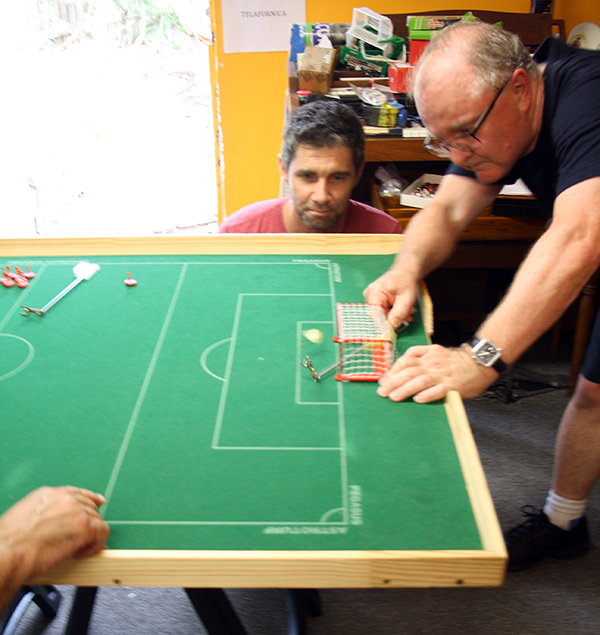 In the opening games, Costa, struggling with strapped knee and elbow (a mix of the stresses and strains of Subbuteo and slot car racing) lost a hard fought match against David. Adrian took a 2 goal lead against Tony before Tony pegged a late one back to make the final couple of minutes uncomfortable. 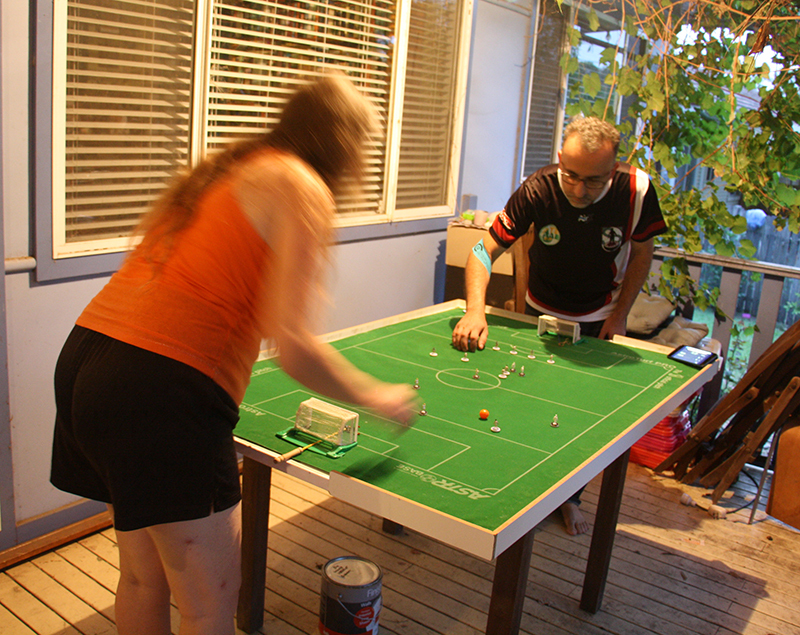 Fabrizio proved too experienced for the improving Heidi on the al fresco pitch in the summer breeze on the verandah. 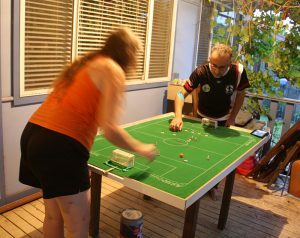 By the time the pool games were finished, Fabrizio had come out on top of the larger group undefeated, followed by David, then Costa, then Heidi. 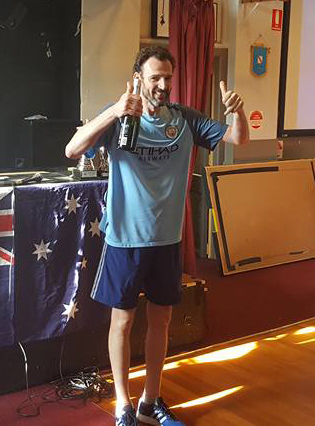 Paul Magee also remained undefeated, topping the smaller group with wins over Adrian and Tony. 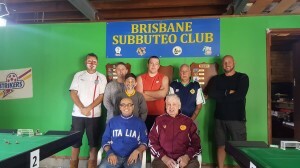 So Fabrizio went to the first semi to face Adrian, Paul squared up against David, and Tony and Costa headed outdoors for the Consolation Final. Tony made light work of Costa who was, by now, flagging terribly under his body’s protests, taking the game 3-0. 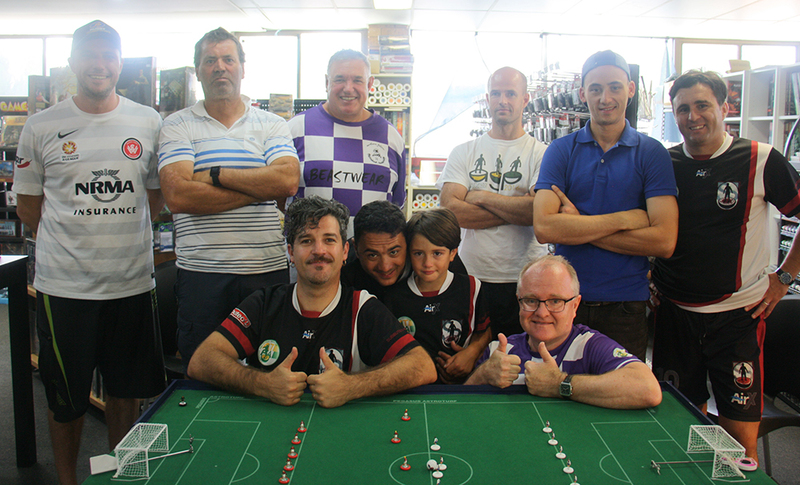 Meanwhile, the major semis went to form with Fabrizio putting 2 unanswered past Adrian and Paul edging David by the lone goal. In the 3rd/4th play-off, David owned the first half and was finally rewarded with a swiftly moved goal in the dying seconds. In the second stanza, Adrian threw everything at David but he, with some help from the woodwork, stood firm to claim his first competitive victory over Adrian and 3rd place in the tournament. Meanwhile, the grand final proved to be one of the more open games of the evening with both players pushing for goals. At half time, Fabrizio held a 2-1 edge and, in a tighter second half, held on for the victory and his 2nd WASPA title in the space of a month. 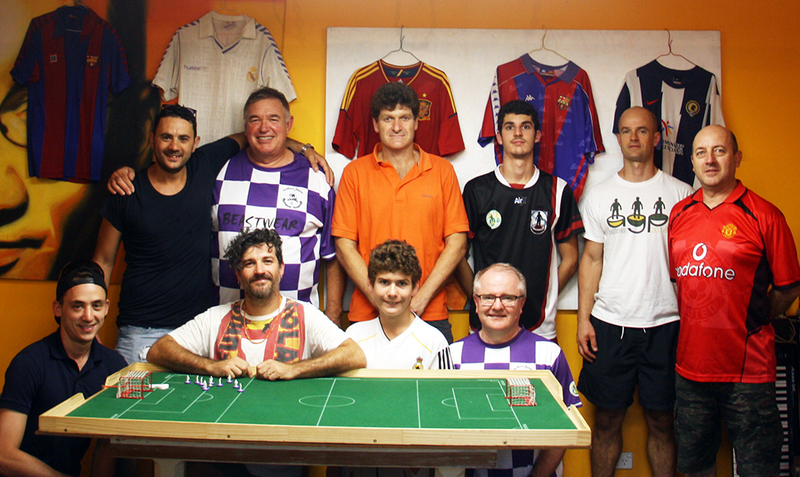 An excellent evening of friendly play. Special mention to Heidi’s son Angus who came along and had his first introduction to the game with some friendly flicks with Paul. With the Australian Grand Prix fast approaching, most of the players will all be using the evening’s tournament as a starting point for their intensive training for the next month, while Costa will be heading for some intensive sessions on the physio couch. 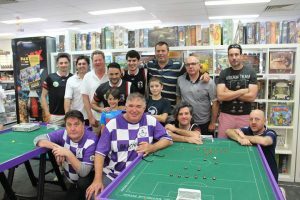 This entry was posted in News, Tournament reports and tagged subbuteo parramatta, tournament report, waspa on 12/01/2017 by ajebec. 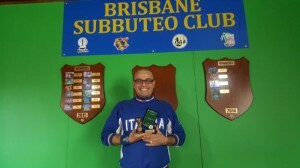 Subbuteo Parramatta’s Daniele Lombardi claimed the 16th AGFA Cup at the Northern Falcons on Sunday, edging teammate Fabrizio Coco 2-1 on shots after a scoreless draw. The AGFA Cup is a great link between the three eras of Australian Subbuteo (70s, the 80s-90s, and now post-2010) and that tradition continued over the weekend with the staging of the 16th Cup at Good Games Chatswood. 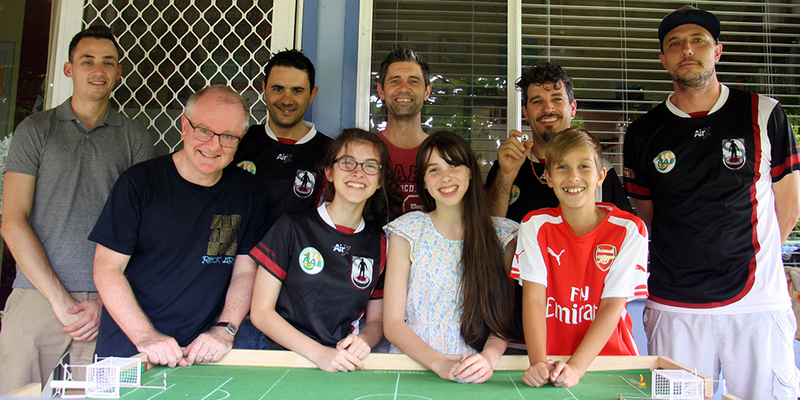 A highlight of the tournament was the appearance of some new faces — Mark Killingbeck and Heidi van Scheik of Hipfingerz and young Ollie Kruse for the Northern Falcons. 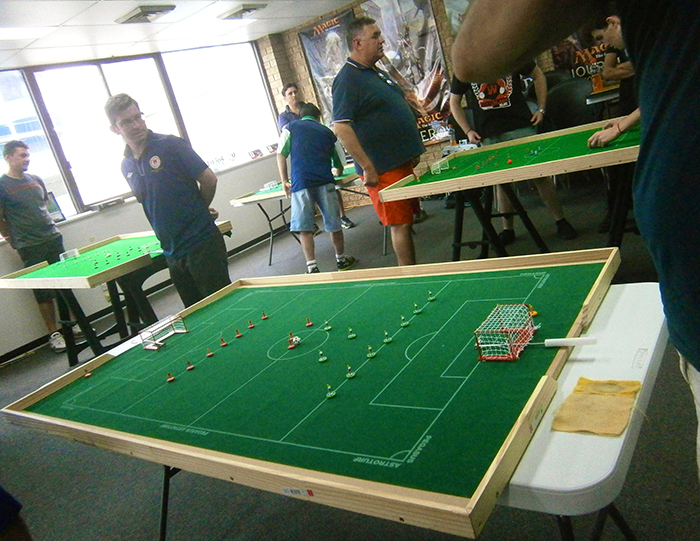 With 16 players, four groups were lined up. 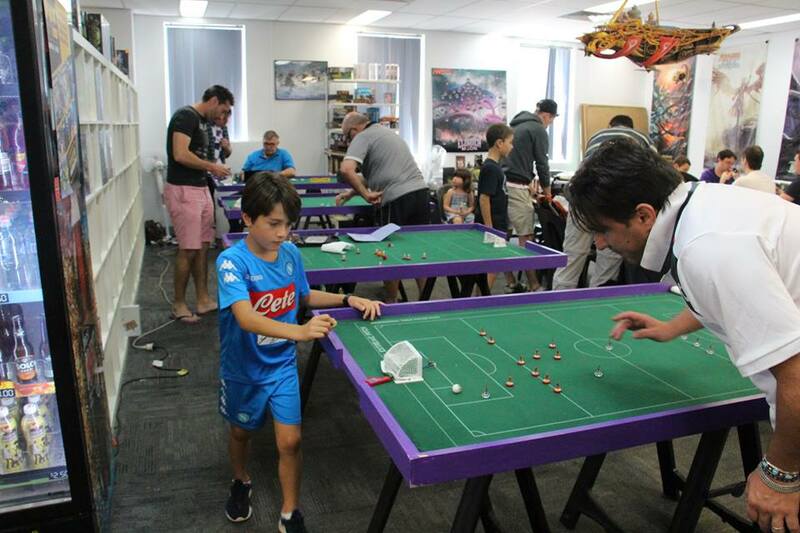 In group 1, young Gabriel Lombardi caused a surprise with a 0-0 draw against Fabrizio, while he also beat Harley Ullrich 1-0. 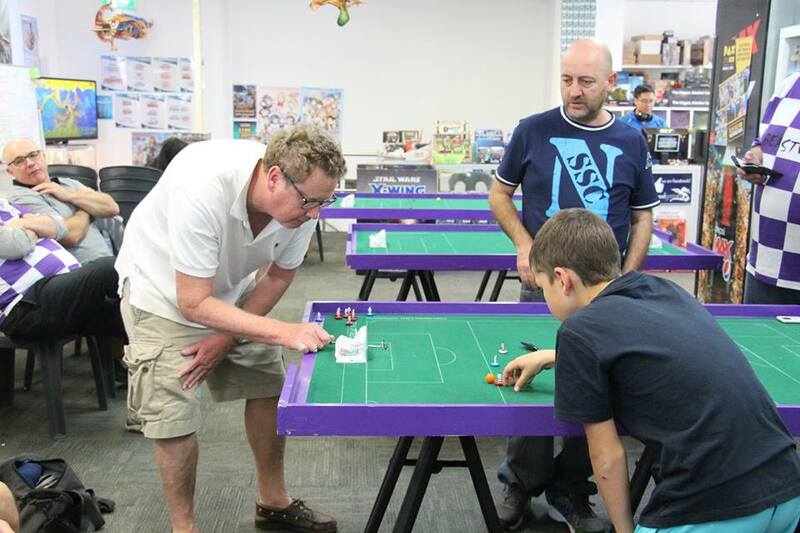 In Group 2, Gary Hosie clinically disposed of Tony Credentino 3-0, while Daniele did the same to Johnny Ball. Gary then beat Daniele 1-0 in a tense encounter, while Johnny eclipsed Tony 1-0. 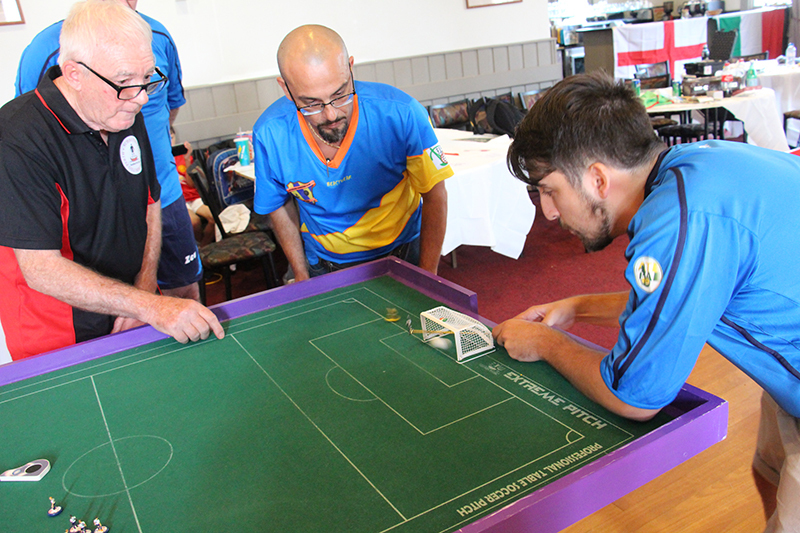 In group 3, Hermann Kruse edged out Dave Sultana 1-0, before scoring an absolute cracker in his 2-1 loss to Raffaele Lombard. 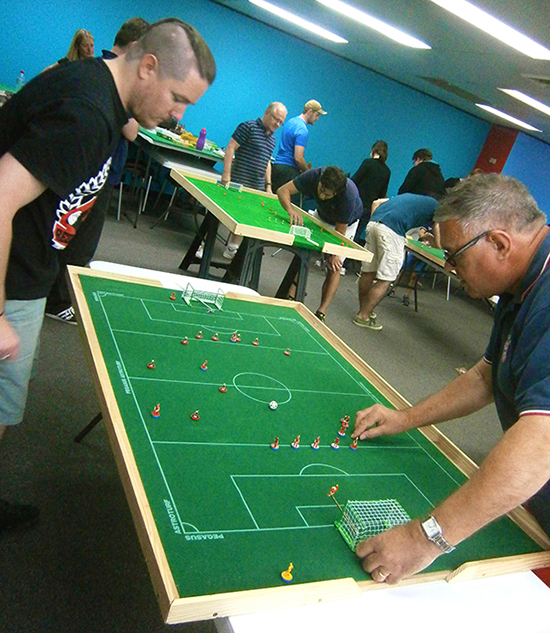 In Group 4, Steve and Adrian continued their ongoing rivalry, with Steve clinching a 1-0 win to take the group. 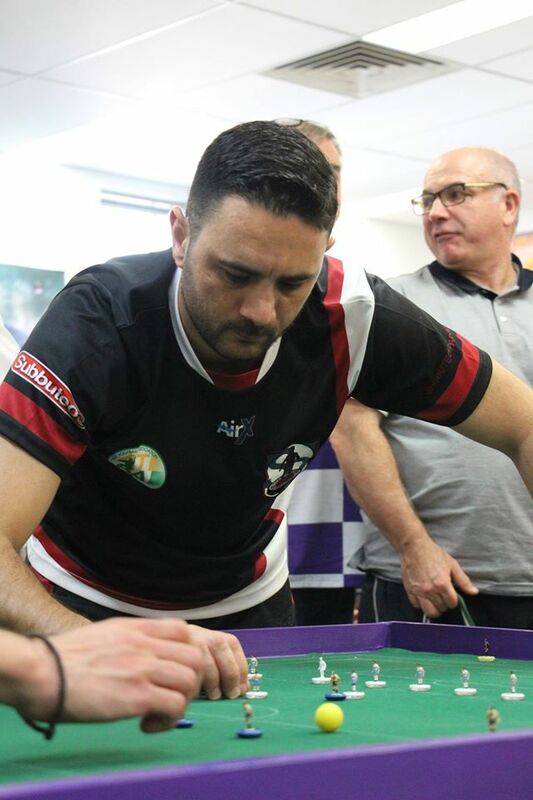 Daniele gained revenge in the quarterfinals, beating Gary 1-0, while Adrian pipped Hermann 1-0 and Raffaele beat Steve by the same score, as Fabrizio overcame Gabriel 2-0. Many thanks to Sonny at Good Games and the rest of the crew for hosting us. This entry was posted in News, Tournament reports and tagged agfa cup, tournament report, waspa tournament on 19/10/2016 by Steve Dettre. 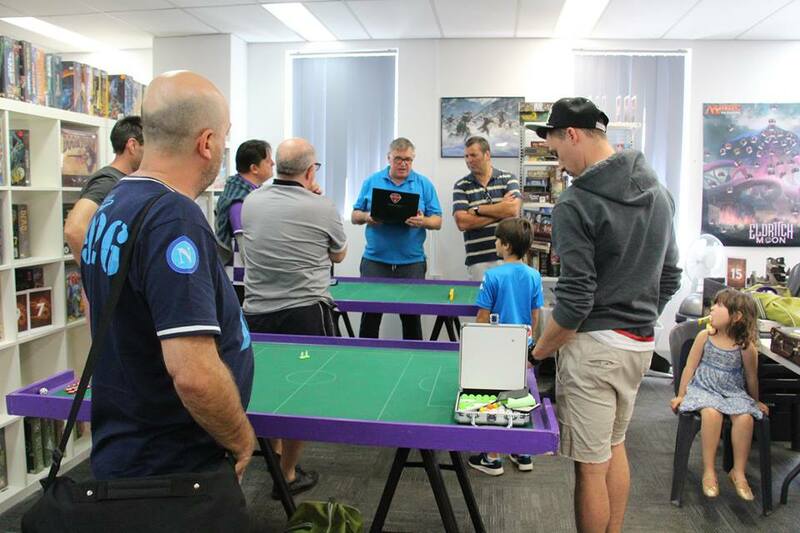 The Subbuteo Parramatta club proudly hosted ATFA’s first ever stand-alone junior tournament during the recent school holidays, with results going towards the players’ WASPA ranking points. 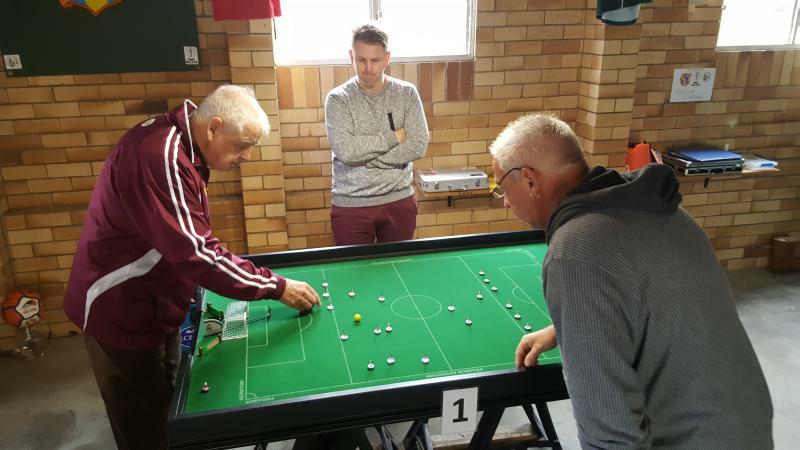 A small but dedicated bunch turned up at the Subbuteo Parramatta clubhouse bright and early on Monday morning to spend a few hours having fun over the Subbuteo pitches. 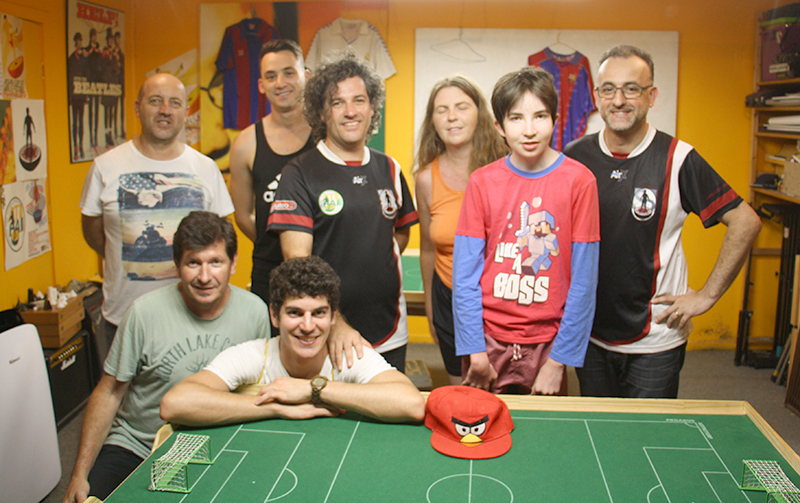 Lucas brought along a couple of mates, brothers Jakob and Thomas, who spent the first round watching how to play and picking up the rules. 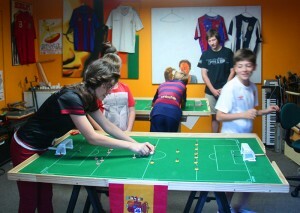 Imojjen and Daniel played out a scoreless draw while Æowyn scored an excitedly celebrated winner in her clash with Lucas. 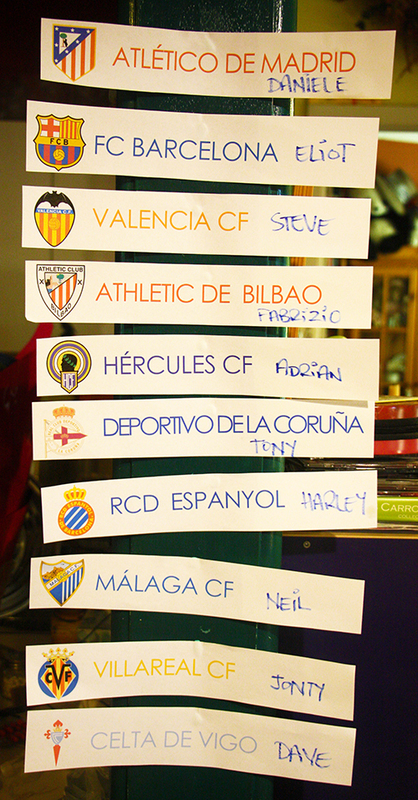 The two new boys got their first taste of playing in the second round of group games. 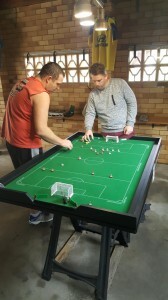 Both showed they had picked up the basics very well. 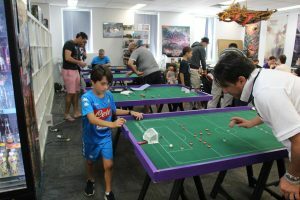 Their respective opponents, Daniel and Lucas both came away with wins, but the margins were small with neither Jakob nor Thomas looking out of place. 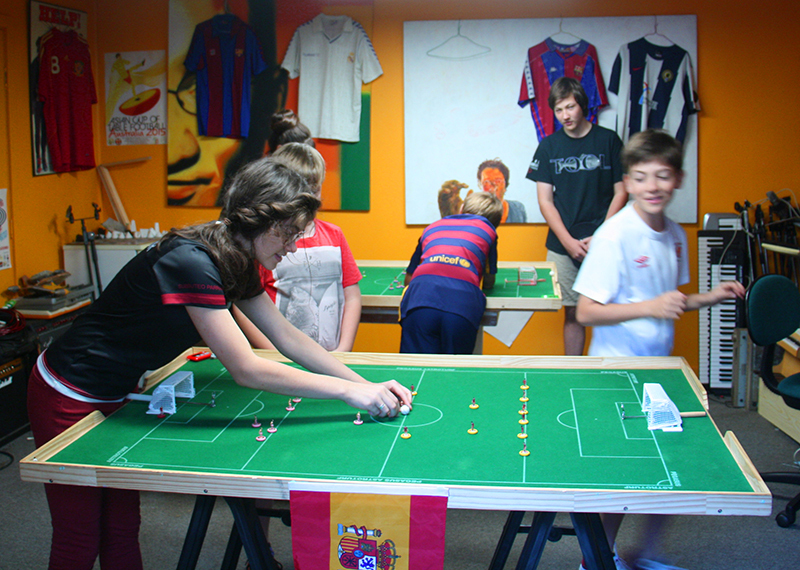 In the final group games, Imojjen slipped one goal past a quickly learning Thomas, while Æowyn and Jakob played out a goalless draw. 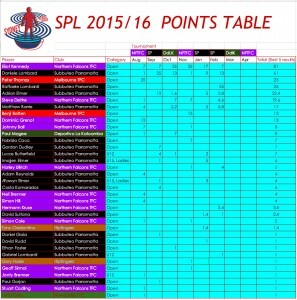 So Daniel came out on top via a superior goal difference in Group One, while Æowyn topped the Group Two table. Thomas, Daniel and the joy of Subbuteo. 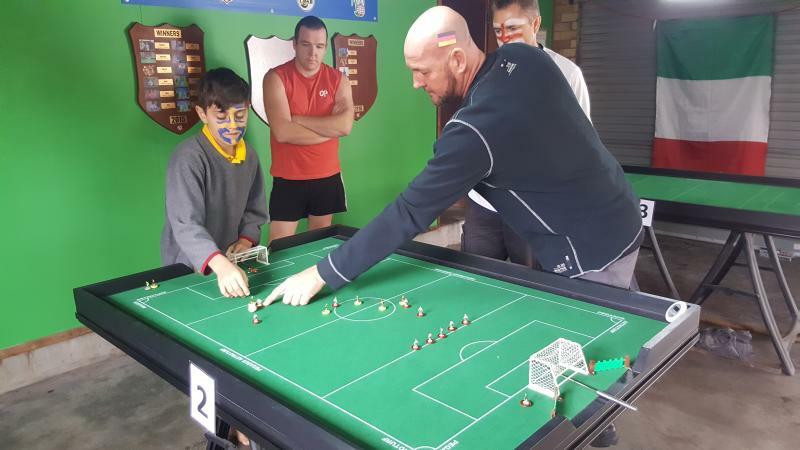 In the first semi-final, Lucas slipped a goal past Daniel to take the match, while the two sisters, Imojjen and Æowyn, picked up their rivalry but couldn’t be separated, even after extra-time. 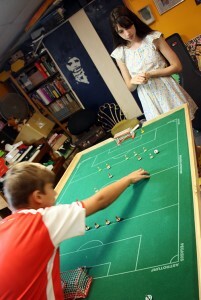 A shoot-out was called for, with both girls bursting with nerves. Hugs were given between each shot but it was Imojjen who prevailed in the end. 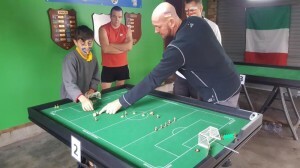 Which means the two group winners were consigned to the 3rd/4th play-off and the two group runners-up were headed to the final, demonstrating the closeness in quality between all the players. 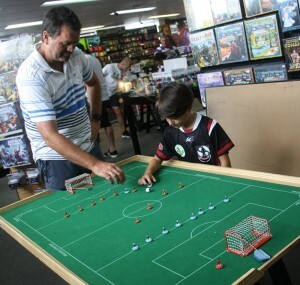 Thomas and Jakob faced each other in the minor placing play-off where big brother Jakob scored his first competitive goal to take a 1-0 victory. 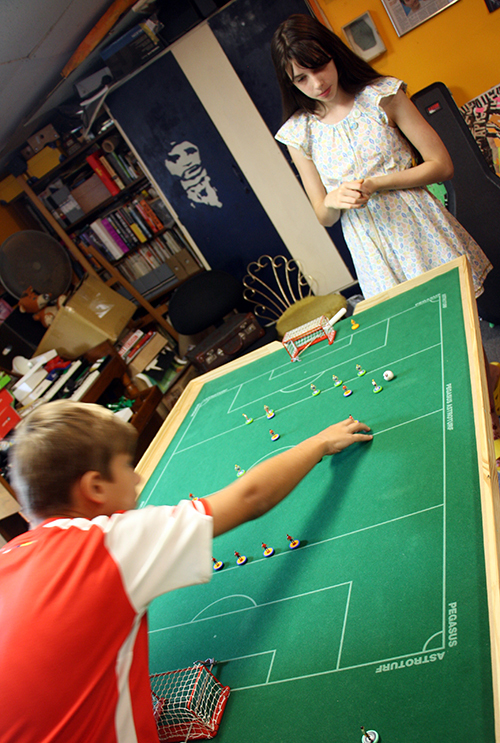 In the 3rd/4th play-off, Daniel snuck a solitary goal past Æowyn with a quick manoeuvre that left Æowyn unable to get her hand on her ‘keeper in time. 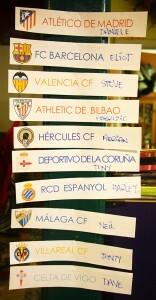 And so to the grand final. Imojjen was playing one of her best games ever and crafted a deserved lead midway through the first half. 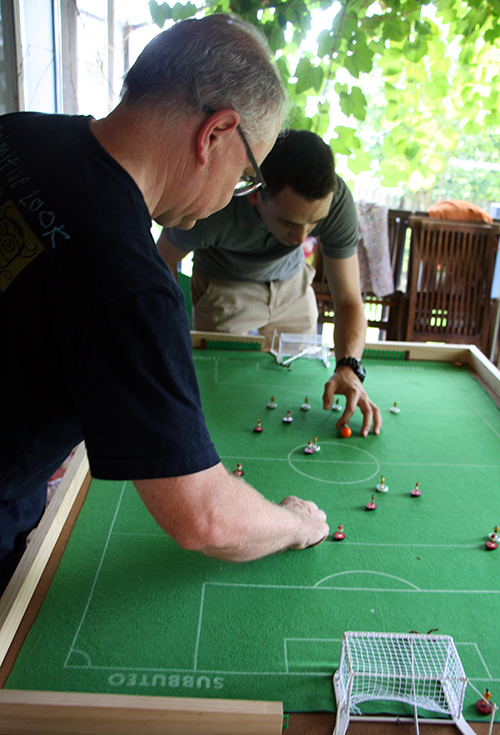 From here the game was a tense affair, with neither player being able to get on top. 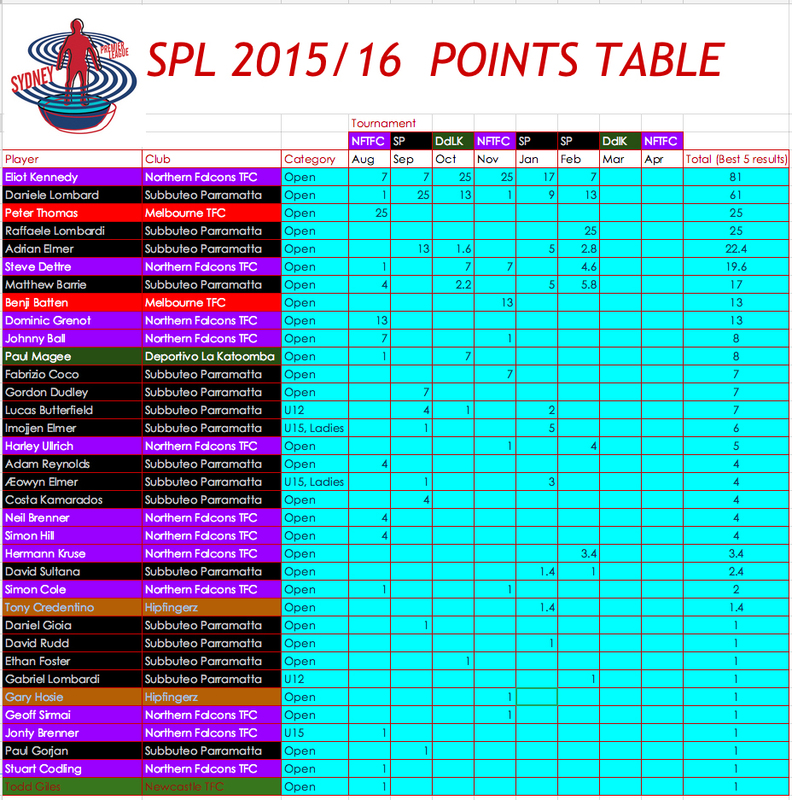 Imojjen looked to be heading to the title but this also lead to nerves kicking in. 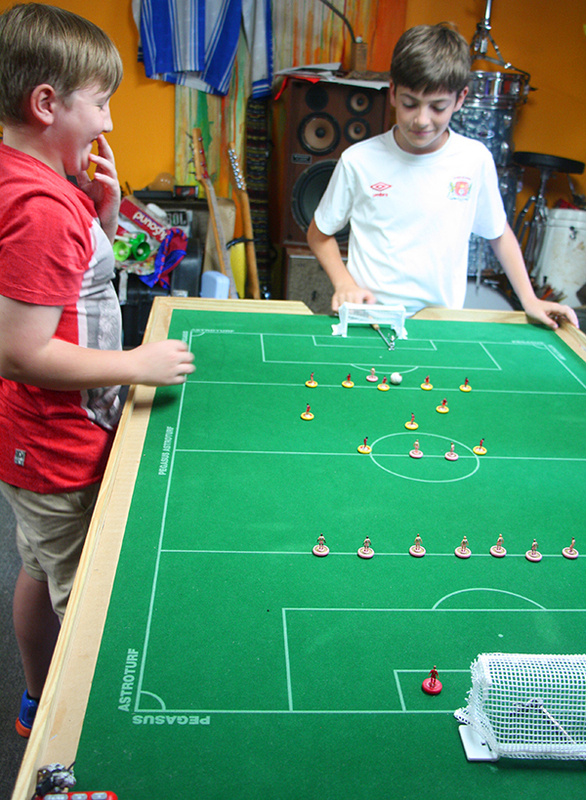 With just over 60 seconds left on the clock, Lucas shot his equaliser into the back of Imojjen’s net. 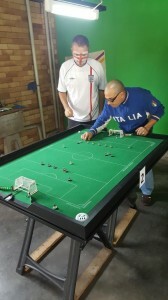 With neither player able to find a quick winner, the game went to extra time. 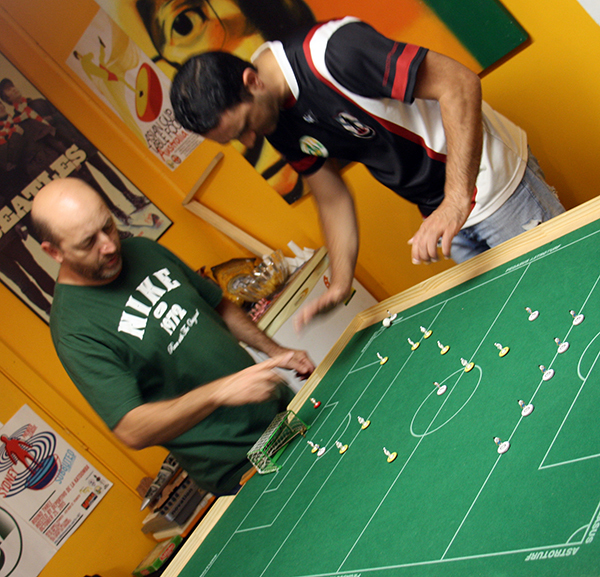 Again, neither player could find a way through for a decisive goal, so shots were called. Lucas took an early lead with his second shot, but Imojjen kept in touch after this. 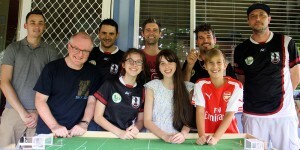 With a chance to draw level with her fourth shot, nerves really kicked in and Imojjen managed an incredible feat – her flicking finger doing an amazing dance around the figure and connecting directly with the ball, sending it off sideways! 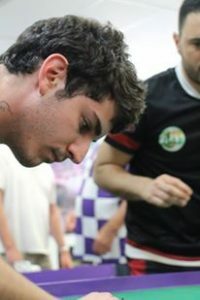 Lucas’ 5th shot was saved by Imojjen, but he held a 2-1 lead, meaning Imojjen needed to score her 5th to send it to sudden death. In spite of a good shot on target, Lucas’ ‘keeper was able to keep the ball out and he jumped off in celebration of his triumph, Imojjen having lost her second consecutive tournament grand-final shoot-out. 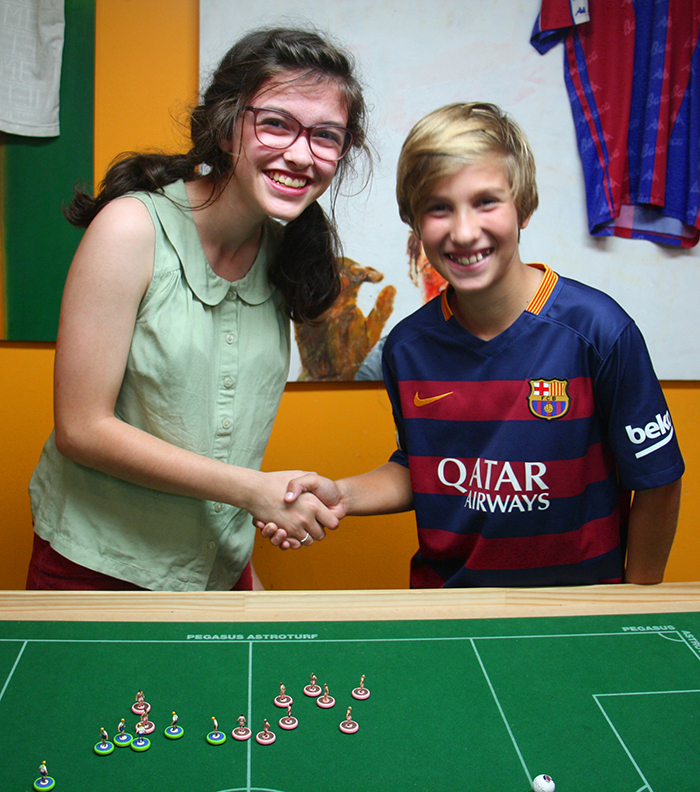 Imojjen and Lucas, the grand-finalists. 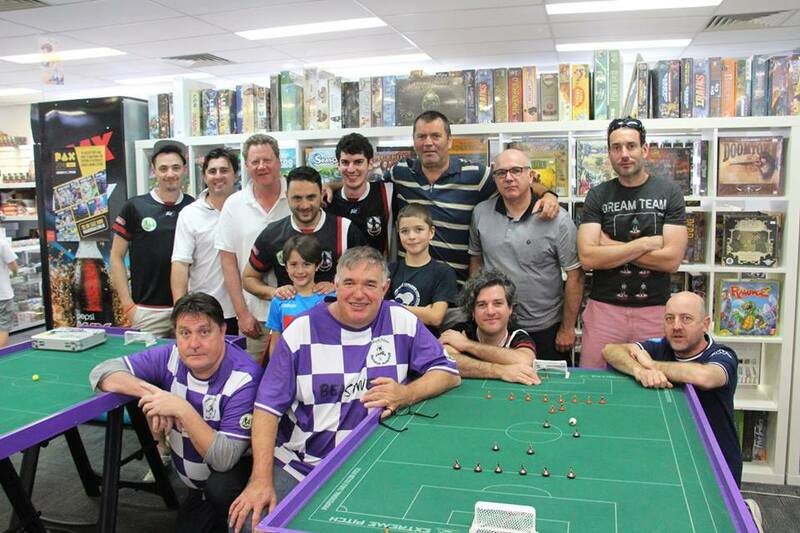 An excellent morning of fun for all involved with a few new players introduced enthusiastically to the great game. A big thanks to Geoff from the Hipfingerz club for making the trip out and helping with officiating. 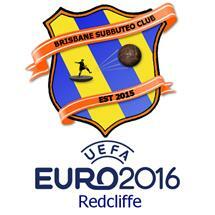 Hopefully we will see the junior scene continue to grow! 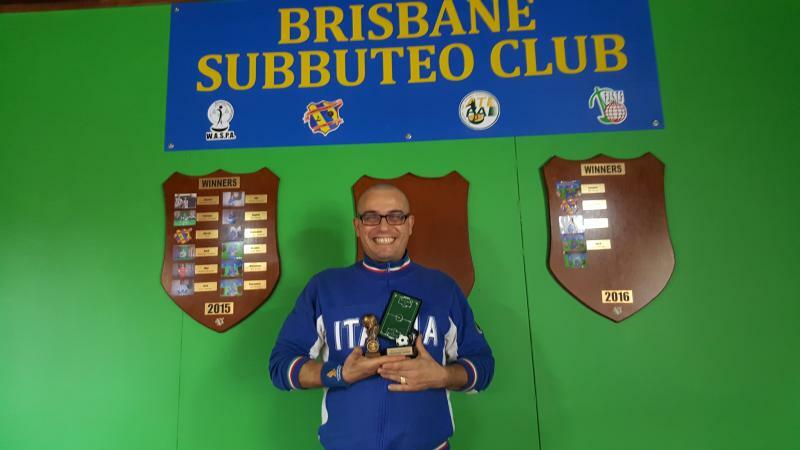 This entry was posted in News and tagged junior tournament, subbuteo parramatta, tournament report, waspa tournament on 25/04/2016 by ajebec.